Twitter users will soon be able to poll their followers without having to rely on crude tallying mechanisms. 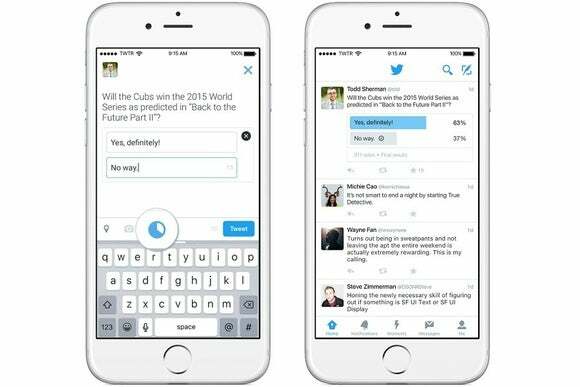 Twitter Polls are rolling out over the next few days on iOS, Android, and desktop web browsers. This will allow anyone to create a question and two possible answers, along with a timeframe for responses. While Twitter says it has previously offered a few different polling methods, these were clumsy hacks at best. For instance, some polls instructed users to Retweet for one choice and Favorite for another, while others created a hashtag under which users were supposed to type out their responses. When the new polling feature arrives, it’ll appear as an option in the compose box, alongside the existing geotag and photo upload buttons. Anyone will be able to create a poll, and anyone will be able to vote on those polls, though Twitter notes that individual voting records will be kept private. The story behind the story: This is just the latest example of Twitter breaking out of the 140-character text mold, as the company has added inline images, auto-playing videos, embedded quote tweets, and news article snapshots in recent years. There’s even been talk of Twitter expanding tweet text beyond 140 characters somehow. Twitter Polls are just one more step in that process—coming just in time for election season.